It is a joy to learn something new and surprising. As a teacher, it is even better when I learn from a student. Here’s a story many of you at TuscanTraveler.com may know, at least in part. It’s about Ann, the Tuscan Traveler. She’s published a book! I wrote the Foreward. Ann was a San Francisco lawyer in search of any enlightenment that nine months in Italy could bring her when she walked into my Italian grammar class in Massa Marittima, near the Tuscan coast, in 1998. To be kind, let’s say that she had no ear for my melodic language. Changing focus, she sought to learn to expand her kitchen skills beyond admittedly delicious chocolate chip cookies and carrot cake to include Florentine and Tuscan recipes. I was conducting cooking classes for Americans and other tourists. Ann, unfortunately, could never master a passable soffritto or achieve al dente when it came to cooking pasta. I was ready to give up on the notion that Ann was ever going to awaken to the state of being Italian even for a day, but then we started to delve into the customs and practices that make Italian food authentic. Maybe it is the lawyer’s need for defined rules and precedents or Ann’s love for research that, combined with her passion for eating, if not cooking, Italian food led her to collect what she came to call the Italian Food Rules. After nine months in Florence became over fifteen years in Italy, Ann is still clearly American, but she knows more than most Italians about the basis of the food practices that are passed down from generation to generation. Her delight in each discovery has frequently been shared in her writing on TuscanTraveler.com and, now, in this enchanting book. 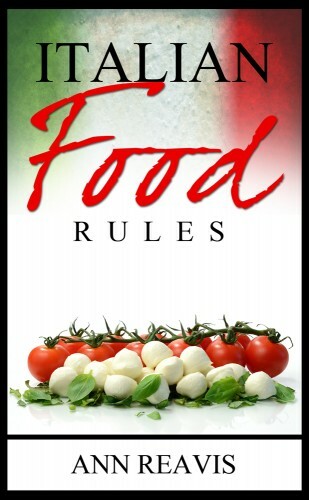 The facts, fictions, history and reasons behind the Italian Food Rules, as well as the revelation of the mere existence of so many customs or edicts, will assist any visitor to Italy by making their stay easier, less confusing, and richer. For Italians, their response to reading Ann’s list of the rules is usually “giusto, giusto” (“exactly right”) and then delight when they read the rationale and history of the gastronomic commandments passed down from their grandmothers. I never knew where Caesar Salad originated (certainly not Italy), or why spaghetti with meatballs was considered an Italian dish, or why Americans always wanted a bowl of olive oil with a squiggle of balsamic vinegar delivered immediately to the table when dining at a trattoria. I enjoy eating lampredotto and lardo on a regular basis, being very familiar with these Tuscan specialties, but I never thought much about their origins in Italian history until Ann started asking questions, urging me to translate at Florentine tripe stands, and traveling to Colonnata to see where herbed lard is aged. The bricks that form the foundation of the most loved cuisine in the world today are important and should be preserved. Ann Reavis has given us the gift of memory in her light and amusing book of Italian Food Rules. 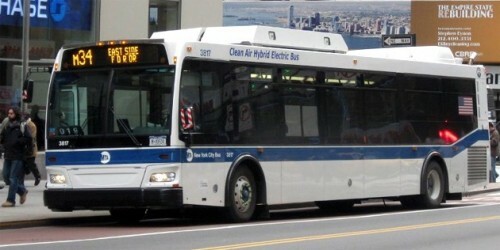 I ride buses when I am in the U.S. and pretty much everywhere else. Every single time I cannot help but notice how nice and customer friendly the bus drivers in the States are. One morning, for example, we were on our way to the Washington, DC train station, schlepping lots of luggage, it was nice that the lady driver “leaned” her bus to help us get on board. She greeted every single passenger and did not answer her cell phone when it rang. Why am I noticing all this? Because I am Florentine. I live in the historic center and I avoid buses as much as I can – to the point of getting soaked in the rain by riding my motorino just to avoid Florentine buses. 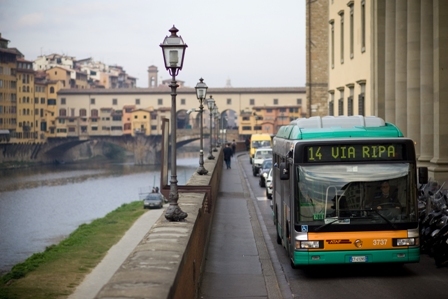 Let me explain for those unfamiliar with the Florence ATAF system: On our Italian buses cell phone calls are always answered. Questions about stops are not answered. Speed limits are not respected. Drivers roar in to halt at the posted stops and brake abruptly at all traffic lights or during the usual dodging of double parked cars, known to all Italian byways. Just take a moment to view these spectacular circus events that were filmed by passengers in Italy and posted on YouTube: here, here and here. 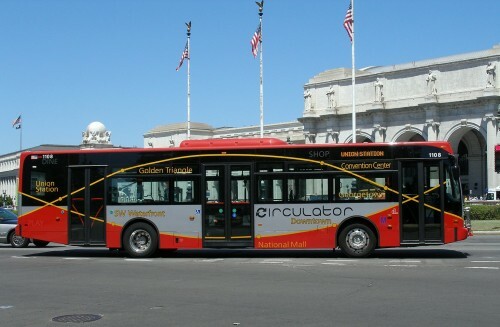 Let’s go back to that morning in Washington, DC to the beautiful African American woman driving the bus, with her long painted nails, and friendly smile. It was pouring down rain. We asked her whether there would be a stop very near the train station. She said we would have to cross the street, but then she offered to take us to her final deposit stop inside the back of Union Station so that we wouldn’t be soaked. When we got there, she explained precisely how to get to the train tracks, smiled and said goodbye. Now I think: either I am very lucky and always find happy drivers when I am in the United States (both in Washington and New York City), or bus drivers are happier there than in Italy, or it is just a matter of general fabulous customer service? In the end if you think about it, doesn’t it take the same amount of calories to smile or be grim? Sometimes I have tried to thank the bus driver in Florence, and I got a look like I was a strange lunatic passenger. And so I will go on riding my motorino, rain or shine in the Renaissance Disneyland where I happen to have been born by mistake, it seems. Have a nice day, and DO watch your step! 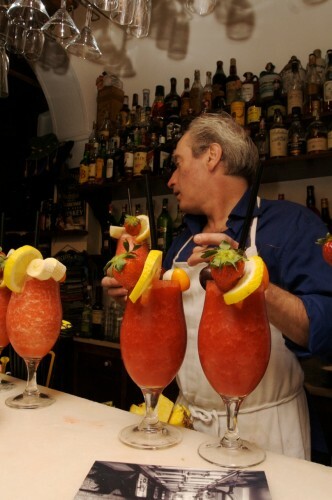 It had been a while since I had gone out for a cocktail, but my friend Ollie had been telling me about this place near Piazza Goldoni that had the best mixed drinks in Florence, perhaps the best in Tuscany, maybe the best in Italy. So when Ollie came to town he finally succeeded in taking me to Art Bar. Wow! WOW! 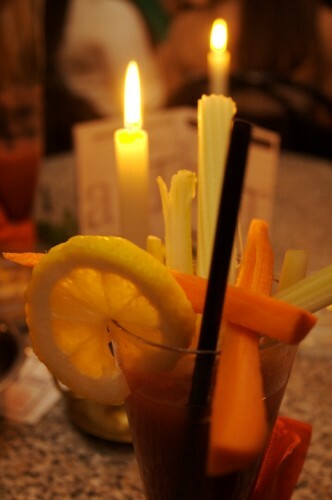 Best cocktail ever. It’s quite a small space, far from fashionable and fancy Florentine bars attended by the smart and ‘in’ crowds. Just a few tables, good friendly service, lots of popcorn to munch while killing the long long time you have to wait for the drink to come. But then…it comes and you wished you had already ordered another one in order not to wait after you have savored the first perfect cocktail. I had a Fruit Mojito with ginger and it came with a fabulous decoration of peaches and candied ginger dipped in brown sugar. This space has had a number of lives as Antico Caffè del Moro, named for Via del Moro where it is located, and Caffè degli Artisti, which has been shortened and updated to Art Bar. 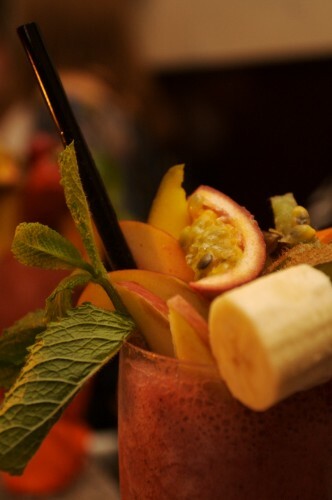 The menu is rich in both fields of alcoholic and non-alcoholic drinks. Behind the bar the two owners, brothers, maybe, look Florentine, and by this I mean with a ‘I don’t give a damn’ attitude, but in this case the attitude was well balanced by the very helpful, polite and smiling waitress (a rare species in Florence). The sign and website say it opens at 6 pm, but it doesn’t. It opens maybe at 6:30 or whenever the owners show up – we waited until 7:30. Did I say ‘ Florentine attitude’ already? 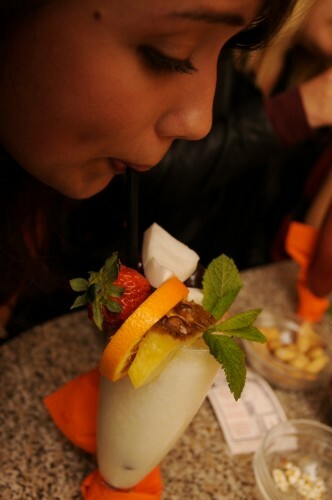 But the ambrosial drink made the wait worthwhile. Thanks,Ollie! I HAD A PIZZA FROM HEAVEN! 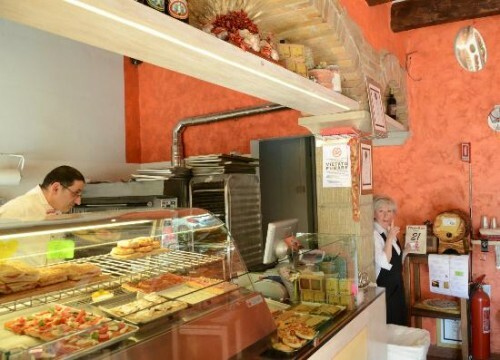 This place is called Divina Pizza and it is situated in a very scruffy (yes, like Guido) neighborhood, on the corner of via dell’Agnolo and Borgo Allegri. 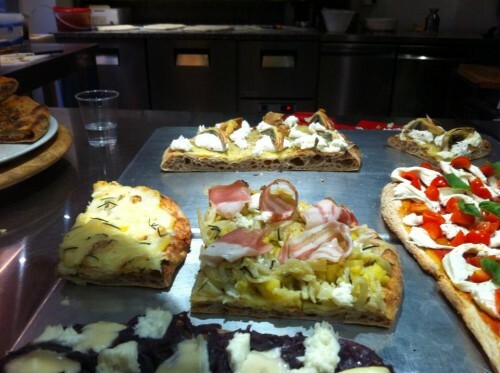 As the pizzaiolo and owner Graziano says, this is not a pizzeria it is a laboratorio artigiano. Already a good start. Let’s see, how to describe it? You can stand or maybe sit on a tall stool if you get one, but it DOES NOT matter. The pizza they produce is worth every possible sacrifice. Graziano made me smell the lievito madre naturale (natural yeast mother) that he keeps re-feeding day after day and that has nothing to do with the usual stinky (his words, and I agree) lievito di birra (brewer’s yeast) that is usually used for pizza. Then he opened the very new first issue of the guide called Pizzerie d’Italia of Gambero Rosso and with pride he showed us the 3 rotelle (cutting wheels) that were awarded just a few days ago for the best pizzeria al taglio (by the slice) in Florence (one of only 2 in Tuscany, the other one is in Arezzo). The organic products that Graziano, his wife Roberta and son Gabriele use, are: a top of the line extra virgin olive oil, very fresh mozzarella fiordilatte and lusty veggies with a hearty glow, but I think the most important ingredient is Petra, a fantastic stone- ground wheat flour. I went there last night after a very not satisfactory meal in another place that I will not mention. So we had already had dinner BUT we were able to ‘vacuum’ two cutting boards full of paradisiacal tastes: slices of pizza with sautèed zucchini and ricotta di pecora (sheep’s milk ricotta), others with mortadella made with maialino felice (happy pork!, as Roberta says), and more eggplants and mozzarella; even the more classic margherita with the sweetest cherry tomatoes was perfect, and then real ‘nduja from Calabria, or should we talk about the focaccia topped with black sesame seeds? As they only use fresh ingredients I can’t wait for winter to have the cavolo nero and lardo di colonnata pizza! Also, for Susanna who cannot eat cheese, Roberta made an amazingly beautiful – yes beautiful – round pizza with string beans, eggplants, carrots, tomatoes, gorgeous black olives (that burned all our mouths because we couldn’t even wait for them to cool off a little bit). Insomma, a beautiful evening accompanied by smiles and love in this little corner of paradise born amidst the plastic food that surrounds us pretty much everywhere you go nowadays, if you happen to live, like me in a very touristy city. I can’t wait to be back there … maybe tonight? 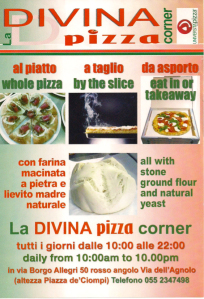 See the video of Divina Pizza.